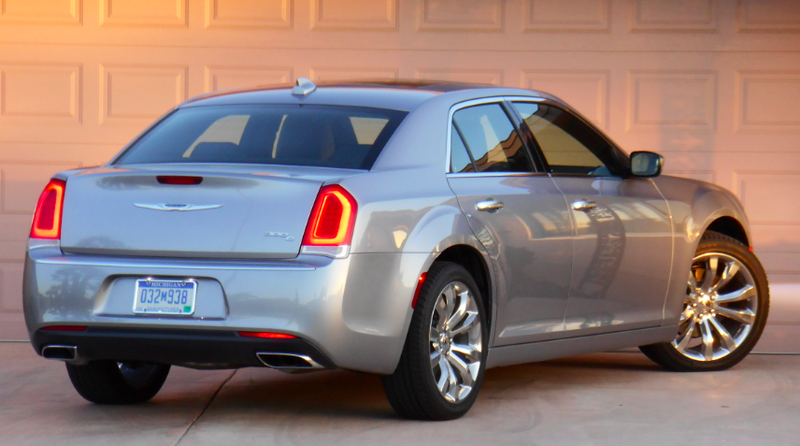 Although considered a “redesign” by Chrysler, the 2015 edition of the company’s flagship 300 sedan doesn’t look much different than it did before–on the outside. Tested was a top-line 300C Platinum, which started at $42,395, but with the optional Hemi V8 and destination charge, ended up at $46,390. Now in its third generation, the redesigned 2015 Chrysler 300 carries on as a traditional, rear-drive American sedan that straddles the line between a “regular” full-size car and a “premium” one. Lest one look at the photos of the 2015 300 and think, “Gee, that doesn’t look like much of a redesign,” it’s worth noting that … it really isn’t. Size didn’t change and the look didn’t much, either (Chrysler says the grille is 30-percent larger), but the interior is revamped and there are some powertrain alterations (which actually come down to “losses”). The 300 is one of the few “traditional” V8-powered rear-wheel-drive sedans currently available (though V6 and all-wheel-drive versions are also offered), and it’s further set apart by its rather boxy profile. In a class now dominated by front-drive/V6-powered competitors, the 300 stands as an old-school holdout. That applies not only to its rear-drive layout and available V8 engine, but also to its comparatively boxy body design. Though a 3.6-liter V6 is standard—and is the only engine choice if available all-wheel drive is desired, as the V8/AWD combo was dropped for 2015—the tested top-line 300C Platinum was fitted with the famed 5.7-liter Hemi V8 producing a stout 363 horsepower. 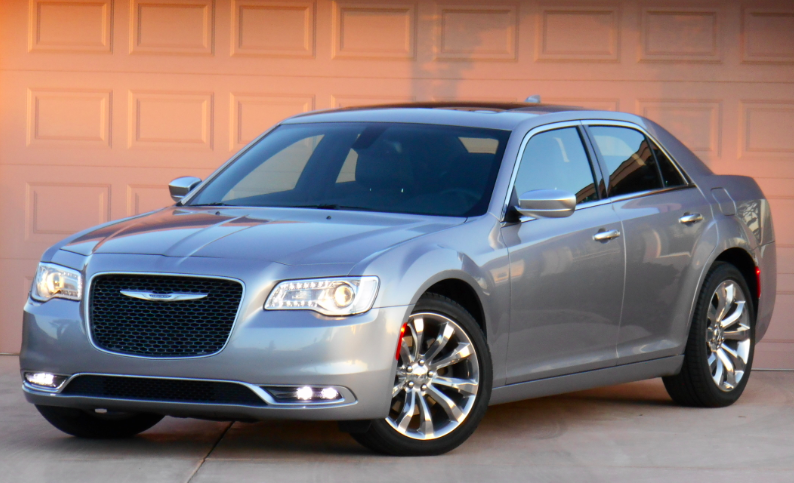 There used to be even stronger SRT8 versions available, but those, too, got lost in the 2015 shuffle. Moving up from the Platinum’s standard V6 to the Hemi V8 costs $3000—initially—as it also brings a 3- to 6-mpg penalty in EPA fuel-economy estimates. Our tester carried a 16 city/25 highway/19 combined rating, and it returned 20.2 mpg in 403 miles of about 70-percent highway driving; so, pretty close to what one would expect. Also as one would expect, the Hemi delivers fine acceleration. There’s strong power everywhere, and the 8-speed automatic transmission (which replaces a 5-speed on V8 models for 2015) provides quick kickdowns in passing situations. 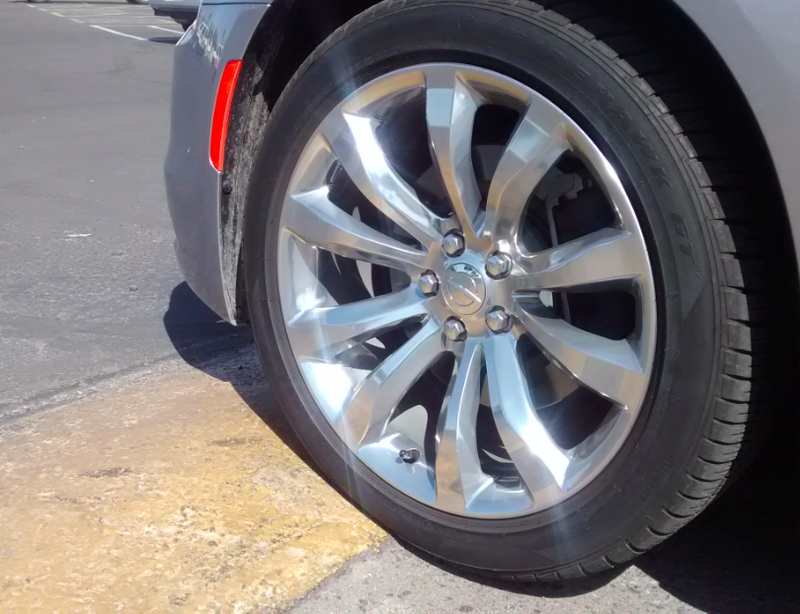 While the Platinum’s suspension handled speed bumps with uncommon poise, its low-profile, 20-inch tires weren’t as adept at soaking up minor pavement imperfections. More of a surprise was the ride quality. While the suspension soaked up large speed bumps with incredible aplomb, the short sidewalls of the low-profile, performance-oriented 245/45R-20 tires weren’t as adept at ignoring minor pavement imperfections, which made themselves known with some nervous patter. But the big car really settles down on the highway, providing a very quiet, solid, confident ride that combines with comfortable seats to make it a great long-distance cruiser—something I really came to appreciate during a 250-mile road trip. Also surprising was the interior room—or rather, the limits of it. We classify the 300 as a Large Car, which its 198.6-inch length and 120-inch wheelbase would imply (being about 8 inches and 11 inches longer, respectively, than those of the midsize Toyota Camry). But the 300 really has midsize space at best. With the front seat all the way down and back, I could easily have driven the car, and I’m 5’9; usually when I max out the seat travel in large vehicles, I can barely touch the gas pedal. And behind the set-back seat, there was just enough room for me to fit without my knees brushing the seatback. In my favored position, there was good room behind me, but it’s doubtful two taller folks would be comfortable in tandem. Blame the rear-drive powertrain here, as the engines sit longitudinally rather than transversely, and the rear differential likely eats up a little bit of space. Chrysler’s Uconnect infotainment system is among the easier ones to use, partly because the main “categories” are permanently displayed along the bottom of the huge touchscreen. The 300’s redesigned interior includes a rotary shift knob that replaces a traditional shift lever, a change we really liked. 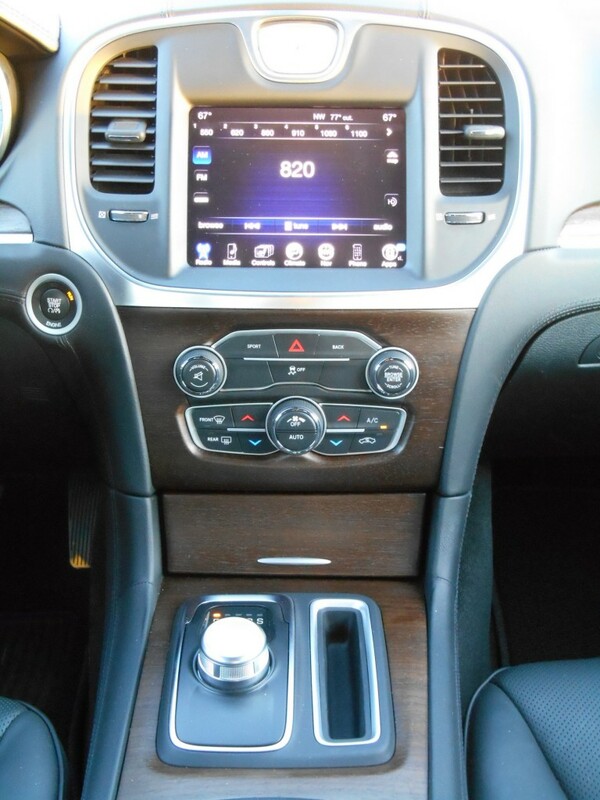 The Platinum carried Chrysler’s Uconnect infotainment system, which is one of the less-confusing ones out there. Audio controls include volume and tuning knobs, with station selection done through the touchscreen; some station-select “buttons” are a bit of a stretch, but there are also station and volume buttons on the back of the steering wheel, which are really handy. Climate controls are within easy reach, but aren’t the most convenient to use. Fan speed is set with a rotary knob–which is fine–but temperature is adjusted through tedious repetitive-step pushbuttons, and mode is altered through the touchscreen. On the positive side, the touchscreen’s “home page” includes a row of permanent buttons along the bottom that let you choose between climate (which includes the seat heaters/coolers), navigation, phone, and other main functions, which then puts specific elements for those functions up on the screen. Visibility is reasonably good. The front roof pillars are angled so that the view to the left front isn’t bad, but it’s not as good to the right front, where you’re looking at the pillar broadside. Side pillars are thinner than many and don’t block much of the over-the-shoulder view (particularly appreciated when changing lanes), and rear pillars are likewise relatively modest, the view when backing being aided by a rearview camera that displays its image on an unusually large dashboard screen. Chrysler positions the 300 as a somewhat upmarket car (with its Dodge Charger corporate stablemate holding down the mainstream position), and the Platinum’s interior suggests that. Padded leather covers many surfaces, and matte-finish, open-pore wood trim helps give it a rich look, aided by matte-silver accents. Although ours was otherwise solid black, two-tone color combinations are available that—at least in some eyes—would spruce it up even more. Interior storage is just adequate, but well thought out. There’s a decent-size, segmented glovebox; small, 2-tier center console box with 12-volt/Aux/USB/and SD-card plugs (terrific all-in-one space); two covered console cupholders that can be heated and cooled (! ); a covered forward-console bin with 12-volt plug (a great place to stash your phone out of sight); a narrow console bin (for pens or glasses); and map pockets with cupholders in the doors. Note that the covers on the cupholders and forward console bin not only help hide their contents from prying eyes, but also give the interior a more “finished” look. The 300C Platinum represents the top of the 300 range, and it supports that status with rich-looking wood trim and lots of padded, leather-covered surfaces. Cargo room is also just adequate. The trunk is wide at the back but narrows considerably between the wheelwells, and the trunklid hinges dip into the load area a bit, though they’re covered. The rear seat backs fold level with the cargo floor but nowhere near flat, and they may hit the front seat back if the seat is far rearward with the backrest reclined. The only option on our top-line 300C Platinum was the $3000 Hemi V8 (which brings with it performance brakes and 160-mph speedometer) that upped its starting price of $42,395 to $46,390 including $995 destination. While it was certainly well equipped with some nifty features, it was still lacking some items I rather expected it to have. Among the niceties were ventilated front seats, heated rear seats, dual-pane panoramic sunroof, Wi-Fi hotspot, and the aforementioned heated and cooled cupholders. But it didn’t have adaptive cruise control or lane-departure warning, both being features that are now often found on much less expensive cars (and that I rather missed on that long highway drive). While they’re likely available optionally, they would be pushing that bottom line closer to (if not over) the unnerving $50,000 threshold. 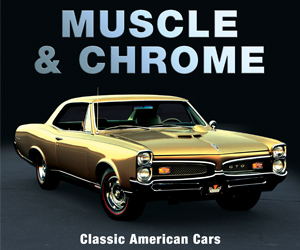 Aside from its Dodge Charger corporate cousin (which costs less and leans toward the performance end of the spectrum, offering engines up to 707 horsepower–! 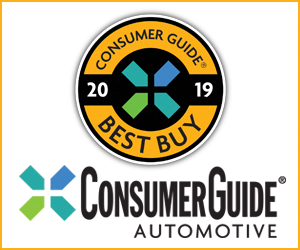 ), the 300’s closest full-size rival might well be the rear-drive Hyundai Genesis, which likewise comes with standard V6, available V8, and V6-optional all-wheel drive. Yet put the two side-by-side, and they look as though they originate on different planets, the boxy 300 contrasting sharply with the svelte, flowing lines of the Genesis (which is also roomier inside, especially for tall drivers). But for those who admire the stately elegance and prominent grille that have long defined some of the world’s most prestigious cars, the 300 is instantly recognizable in an era where most competitors are shaped like a jellybean wanna-be. Written by: The Daily Drive staff on August 7, 2015.on April 26, 2018.